I got a cup measure for birthday!! Yeah!!! It's not one of these fancy multiple-spoon-matryoshka-eske tools, but an ordinary measuring cup. But it's all I need, and it even measures liquid ounces! Maybe, when I will be in Washington/NY the coming weeks I will look for a spoon-measure for table- and tea-spoons, but this is not implicitly necessary. Good for you! And, Happy Birthday! So what did you use for measurements before? You're so lucky to be living in Vienna - beautiful city. I've been there once, many years ago and intend to return for a visit someday. Thanks for stopping by and bake on!! Thank God that you no longer have to do further conversions! Aside from World Peace, I vote for standardized measurements in worldwide recipes!! Wouldn't it be nice?! Nice feedback on my latest entry; appreciate it. Best wishes to you in your new undertaking! Looking good. 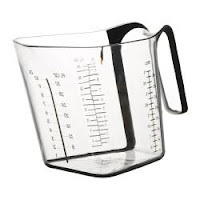 Can't wait to see what you can make with that fancy measuring cup.